I am surprised that fuel capacity has been reduced by over a gallon. Zero info on HP and torque comparison to existing Wing, and review below says "not much more power". If this thing underperforms (based on just raw acceleration) the GTL, that would be very unsettling to put it mildly and a huge oversight. The weight reduction might overcome some of what little power seems to have been added, but maybe not. No mention of "Cornering ABS" but I might have missed that spec. A full gallon reduction in fuel capacity, even with a suggested 22% increase in mpg. Will a sleeker bike increase sales to younger people despite knocking almost a third off of cargo and barely improving a 17 year old power capability, 4 valve or no 4 valve? Dunno. What is it? A cruiser, a sport tourer, a bagger, a full tourer? Help me out here. Jack of all trades but master at none? So now I've gone from definitely to probably, to maybe, to think I'm going to pull my deposit and wait till I can touch the real thing in a showroom, test ride it, and get my wife's opinion on it's ability to hold our next two week trip's worth of stuff. And just for the record, we are highly experienced packers. We take long trips with the absolute minimum. PH.ds in motorcycle touring packing for both of us. Adding a luggage rack wouldn't make up a 40 liter difference as we already do that. And no, I don't pull trailers any more. They're a PIA. Can't figure out why I'm feeling slightly depressed. Oh I know, years and years of waiting and speculation, and now being presented with a middle of the road powered bike with jack for storage and a diminished seat for my better half. Calling two dealers tomorrow to pull my deposits. That it is! But after looking at all the bells and whistles of this 2018 model, I will happily stay with my 2015. I'll take all the bells and whistles they want to bolt on. My issue is what I see to be severe oversights. Poorer seat, underpowered, pathetic storage, and noisy pipes. Despite all the other great improvements, which by the way have mostly been off the shelf for almost 10 years. Appears they stretched the stroke and came with a smaller bore? Why not just keep the same bore? Make the bore even larger, if you're set on changing the bore. Smaller fuel capacity and less luggage are enough to say no, for me. Less travel on the front end? Less luggage? What were they thinking at Honda? The bright spot for me, is the 6th gear. Not enough to purchase. I'll wait till they get it right. Just my guess, but a smaller bore helps to allow for a shorter engine front-to-back, which seemed to be a major design goal. Trade-off is a longer stroke and possible a wider engine, but it looks like they were able to make that up elsewhere, as the motor appears a touch narrower than before. Not sure what you mean by keeping the stroke the same by making it up elsewhere. The engine only gained about 5HP. They added valves but that didn't seem to make any difference. Maybe some in the midrange according to ulimatemotorcycling.com but nothing significant. Compression ratio? Not sure that was any help either. I REALLY don't get this. The GTL weighs under 800 pounds and puts out 160 HP. They HAD to be using this as a benchmark. 10.5 compression ratio. Premium gas required??? In general I'm not impressed. Honda's idea of aerodynamics: Narrow the fairing and windshield and then have to move the rider forward to reduce wind buffeting. Ingenious! I'm old enough to remember the GL1800 intro back in late 2000. Lots of talk about "not your father's Goldwing", etc. Folks seemed pleased with the better power & handling, not so much on reduced storage & tire life. I didn't like the looks either. Bought one after riding one (big mistake there! ), rationalized the looks by telling myself I didn't have to look at it while riding it. Reduced storage? Well, that's what the camper was for. Same sort of talk today, just different specifics. 1. Was Honda getting away from wired headsets? The fine print in the Apple CarPlay blurb says you need a Bluetooth headset to make the system work. They mention a CB radio option (the only thing I really use a headset for), but don't show anything. I'm not fond of that idea, but am willing to be convinced. 2. How bad is it going to be to change out an air filter on the new bike? Any other servicing nightmares involved? 3. I saw a reference to a trunk *removal* kit for the Tour models. Could that be used along with a luggage rack to allow for more storage (like camping gear, etc. that's too big/bulky to fit in the bags/trunk)? 3a. And, for those of us who travel solo, could that luggage rack extend over the current passenger seat to offer even more storage? 4. LED fog lights look nice, but why split them apart from the mounting kit? Perhaps the lights are only replaceable as an assembly, so this allows you to buy replacements without the mounting hardware? While agreeing with what everyone has said, just one of the things I would like to add, is that it is everything I expected it to be, cheap Mickey Mouse bleedin rubbish, compared to what it should be. I have been a biker for 43 years, like WingVetteGSXR, and no doubt many others, I bought my first Goldwing in 1982, and rode nothing but GoldWings since, no one loves the GoldWing more than I, a mammoth heavy monster of a machine, which is what it has always been, and should be. There is nothing about the 2018 I have seen that I like. Why cant they just make it better, not smaller and cheaper, I thought the F6B and Pan was introduced for people wanting a smaller sportier GoldWing. I am thankful to be at an age where I have rode them all for the past 36 years, and loved every mile. I'm starting the first new rumor for the new, new GL1800 (probably 20 years hence): Supercharged! Having said that, I'll be looking forward to the comparison testing in the next few months. Unlikely with modern engine electronics. My 2015 Mazda3's motor has a 13.0:1 CR, and calls for 87 octane. I run the cheapest regular I can find. Such a disappointment. The lack of storage space kills this thing for me. The new Yamaha Venture and even the Harley Road Glide Ultra boast more storage space. I'm genuinely not sure who will buy it. I certainly hope their plan wasn't to try to capture the younger generation. I'm 25 and if I wanted a new touring bike, I'd be hard pressed to turn down the new Venture. Honestly, I'd have a Harley before the new Goldwing. Honestly though, I'll just be keeping my Gl1500 for the foreseeable future. If I want a sport touring bike, I'll buy one. However, I don't want a sport touring bike. 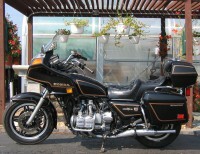 I want a Goldwing and they don't sell those anymore. I just don't get Honda's thinking on this. A top of the line Touring bike, and they reduce luggage space?? Why stop there. They probably have no need to ride long distances on this premier Touring bike so, Let's reduce fuel capacity too! Oh yeah, and they probably don't want a lot of wind protection, so let's make the windshield a little smaller. Let's put the icing on 7th wonder, and raise the price!!! There you go, Persent Goldwing owners! I Can't believe what a terrible job they did on this. A small increase in displacement, keep the 6th gear, keep the 4 valve head, keep the (hopefully) improved front end, and I would've been the owner of a new and improved Goldwing. There is no way I am considering this. I would consider a 2017 (with significant discount) before considering this 2018. What a disappointment! What were they thinking at Honda??????? I think you may need to do a bit more research before you continue your rant. - Is there "BMW/powerlet" style ports for a two electric vests? Please don't tell me I'd have to start drilling and hunting under fairings for a hot lead again. - So which is it, the passenger is now farther forward and out of the buffeting, or in more wind to alleviate the still air bubble on hot days? - As stated below, is this bike "pickupable" in a parking lot tipover like my '03 or not? If not, 850 pounds and crashed plastic will result. - No cornering ABS technology that I can see, am I missing it? 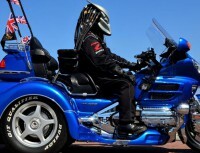 - USB power in the trunk and saddlebags? - The accessory trunk rack in the picture looks really small or is it just my eyes? I think they hit a home run stylewise. One of the coolest looking straight-from-the-factory bikes I've seen in a while. Great lines and plenty of them, sleek. Love the integrated paint scheme, nose to tail. I know I like looking at it. At first glance I really like the look, a ST1300 on steriods with a trunk or without. I like most of the improvements and it should be a blast in the twisties. I'm sure it will take some getting used to with less storage, more importantly with two up. Speaking of two up, I'm sorry to say our co-riders might not be coming with us as often. Will I buy one, not yet, but here's hoping Honda's plans come together. If it's the younger crowd Honda is going after, here's hoping they have the disposable income needed to buy one, because here in Canada the 2018 Gold Wing Touring DCT w/airbag will be over $40K with taxes. I don't know many 20-30 year olds who have that kind of money to throw at this Techno Wing. For now I'll hang onto my 2013 Gold Wing Level IV for a few years. Besides I just bought all the bling I want to make it mine, and here is the most important part, my co-rider has lots of room in our cargo trailer for a case of wine and all her clothes and shoes. Happy wife, happy life. P.S. They better design a Transformers style cargo trailer to tow behind because anything else will look stupid. I guess any trailer will look stupid. I was disappointed when I changed from my 1987 to my current 2010 Goldwing because the luggage capacity is now a LOT less and the (newer) engine seems less lively. Mind you, that could be due to the extra weight of the 2010 model despite an official gain in power. The 2010 windscreen is not a real windscreen. When it really rains I can't duck behind it like I could on my "old" one. And now Honda made the luggage capacity and the screen smaller? My guess is that Honda want to attract new buyers and does not care if current Goldwing owners will replace their current wings with the new model. 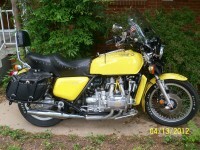 My advice: Stick with whatever Goldwing you have. The older yours is, the better off you are when actually touring! Age does not matter to a Goldwing, they will last a lifetime. I have ridden Goldwings since the first generation and each subsequent generation has been better than the previous one. No one here has ridden the 2018 and yet many have preconceived notions of what they don't don't like about it. Keep in mind all you old f@rts, you are not the target demographic for the 2018 wing it's the post millennial yuppy is what they are targeting, the ones with money, not just pension cheques. If you want 50,000 litres of storage space buy a minivan. A real biker only needs a change of underwear and a credit card to travel. Ode to oldwing1100 - "Keep in mind all you old f@rts, you are not the target demographic for the 2018 wing it's the post millennial yuppy is what they are targeting, the ones with money, not just pension cheques." EXCELLENT! 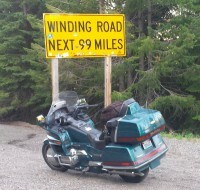 - I myself am in my 45th year of riding and could not agree more with oldwing1100's spot on observation. IMO Honda had always been the cutting edge industry leader and frankly, they've been overdue in that respect for quite some period of time regarding their marques flagship. 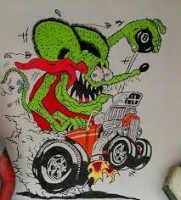 We can expect initial rave reviews from the motorcycle press because that's what sells advertising. I've often stated I've never seen a motorcycle I didn't like and the new Goldwing is no exception. In following this thread I recognize that I'm blessed by (not) being in the market for any new motorcycle. I have no need to announce to the world that I'm off to pull multiple refundable deposits from several dealers in a show of my absolute warrior like consumer disgust, while at the same time explaining to the not so little lady that we're not getting a new Goldwing now because there's not enough storage capacity to bring along the kitchen sink...Ride ON! If you're happy with what you have that's fine. All the comments about why not to buy, consider, praise, etc are presumably based upon personal preferences, but essentially relate to actually riding previous Wings. Impressions beyond a spec sheet and images cannot tell the whole story, so maybe wait and see is necessary ? On the other hand, what makes someone place multiple deposits for something even unseen, I just don't get that one unless of course something else is in play. The bottom line seems to be contentment with what you have, including PhDs in packing, and finding a justification not to keep up with the "hey look at what I have" view of motorcycles. If it does, DO, if it doesn't, DON'T.